Sea level rise from climate change threatens the livelihoods of poor subsistence farmers across Asia. But salt-tolerant crops may offer them a future, scientists say. On a sun-scorched wasteland near India's southern tip, an unlikely garden filled with spiky shrubs and spindly greens is growing, seemingly against all odds. 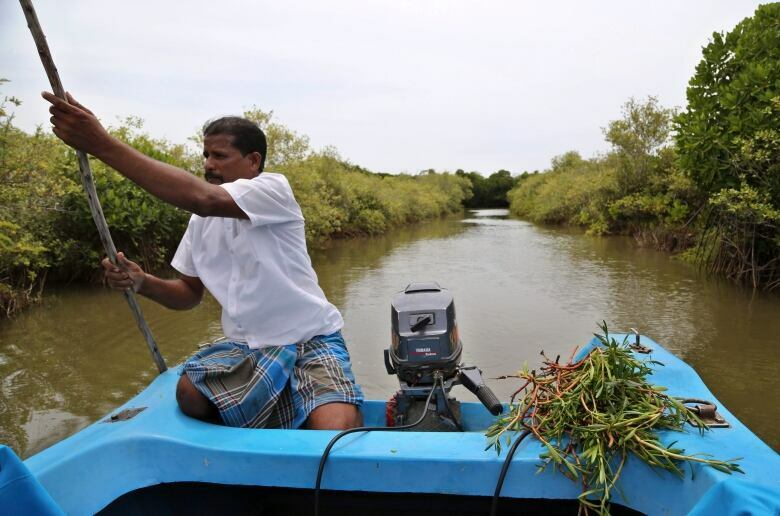 "It's hard to imagine how farmers will live," said Tapas Paul, who as a World Bank official helped channel about $100,000 to help build the small garden a decade ago in a swampy, seaside town dominated by salt flats in southern Tamil Nadu state. "In the places subject to inundation and sea level rise, there are few options." A team of Indian scientists is searching for solutions to what they describe as a fast-approaching agricultural crisis. Their neatly plotted rows of naturally salt-tolerant plants, known as halophytes, could be a part of the answer. The scientists from the M.S. Swaminathan Research Foundation are also trying other approaches: tweaking genes and cross-breeding plants by conventional means to discover which might grow and even flourish. "Sea level rise is inevitable, and we are not prepared," said Swaminathan, who pioneered high-yield wheat and rice varieties for India in the 1960s. "The biggest problem in India is just the very large population. We can say people can relocate, but where could we even accommodate all those who need to move inland? Saltwater for a farmer long meant certain crop failure. Wartime foes sowed enemy fields with salt to ensure social collapse. Natural disasters such as the 2004 Asian tsunami left countless plots unproductive for years. Asia's coastal farmers, including millions impoverished in India, now face such problems. Climate change will bring stronger storms and warmer temperatures that expand ocean waters and melt ice caps and glaciers. As a result, seas are set to rise up to one metre (3.2 feet) in this century, according to the latest scientific forecasts. 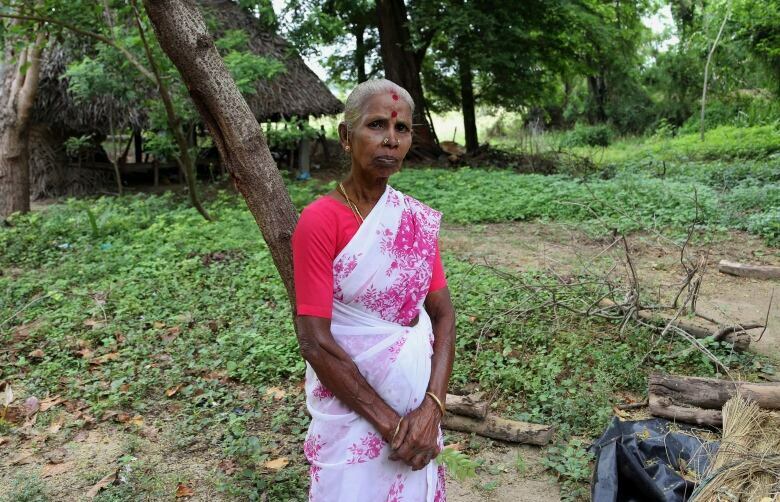 Chellammal, a graceful, 65-year-old farming housewife in the Tamil Nadu village of Tetakudi, knows the nightmare of farming on salt-contaminated land too well. "I struggled so long to get things to grow, but nothing worked," said Chellammal, who goes by one name. "Every year just got worse until there was nothing left," she said, crouched in a bright pink sari by her fields. 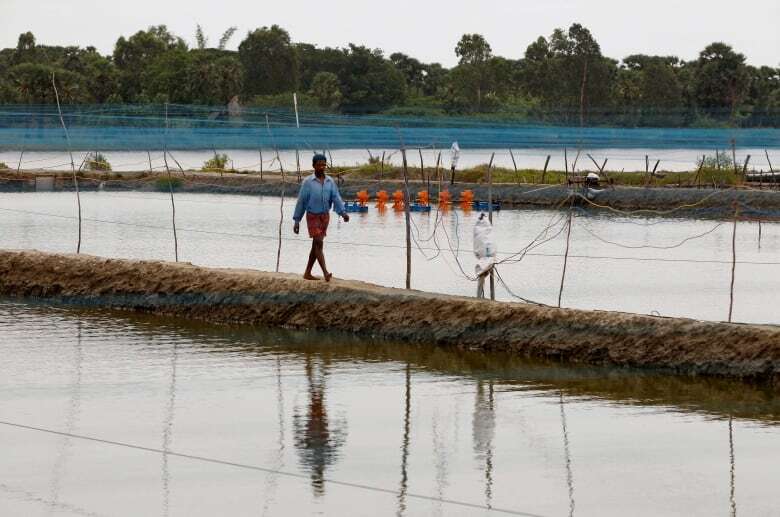 The land her family had saved for decades to buy went completely barren about five years ago, after a neighbouring village took up shrimp farming when flooding from a nearby ocean canal salted their lands. The shrimp ponds were never lined properly, so their saltwater seeped into surrounding soils. 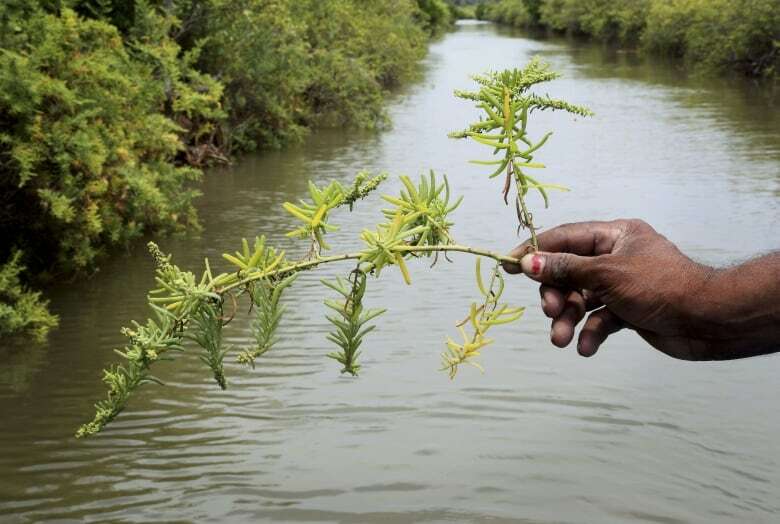 The farmland lost by Tetakudi's 200 households now supports little more than a vast expanse of salt-tolerant shrubs called Suaeda maritime along with succulents called Salicornia brachiata, known to locals as "chicken feet." To the villagers, the bright green bushes are no better than weeds. Already, 12 families have boarded up their homes and left. But scientists say suaeda is good for firewood. And salicornia species, which can tolerate nearly twice the salinity of seawater, have enormous potential as a biofuel crop, with seeds containing high concentrations of oil. The problem, however, lies in realizing profits. For any crop to work on a large scale, inexpensive methods and machinery for harvesting will have to be developed. Then processing plants, production lines and markets would need to be built. As of now, none of that exists. Chellammal is dubious, but interested. "If we can make money from what we grow, we'll try it. Why not?" she said. "Maybe all is not lost." The timing for an agricultural crisis due to sea rise couldn't be worse. India's poor farmers already struggle with frequent flooding, drought and soils degraded by agrochemical overuse. Those on the coast are also hit by storms, with at least 27 of the 35 deadliest cyclones in history barrelling through the Bay of Bengal before slamming into either India or Bangladesh. India's freshwater sources are also in peril, with over-tapped groundwater reserves so low the country is expected to have only half the water it needs by 2030. Grain production, meanwhile, has stalled around 260 million tons in recent years, despite global pressure for India to boost yields, eliminate waste and eradicate widespread poverty and malnutrition. To feed its growing 1.26 billion population, India must increase food production 45 per cent by 2050, for which experts say it may need to cultivate more land. 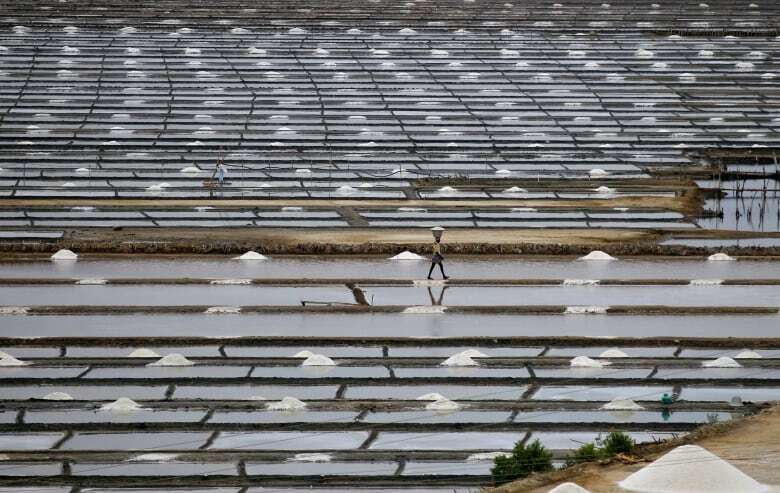 Instead, about 1.2 million hectares (3 million acres) of its coastal farmland has been degraded by salt, according to India's Central Soil Salinity Research Institute. Inland, India has lost another 5.5 million hectares of arable farmland, out of its nationwide total of 163 million hectares, though India's soil salinity troubles are exacerbated by industrial salt flats, a growing number of shrimp farms and the depletion of groundwater reserves. The trend will only continue as seawater creeps onto low-lying lands along the 7,500-kilometre (4,700-mile) coast that outlines the country along the Bay of Bengal, Indian Ocean and Arabian Sea. "Saltwater agriculture is considered a futuristic area. But it really shouldn't be," said marine biologist V. Selvam, the M.S. Swaminathan foundation's mustachioed director of coastal research. "Very soon there won't be enough land and water to meet our needs." And India is not alone. Countries including Egypt, Bangladesh and much of Southeast Asia also face heavy saltwater intrusion and loss of farmland. Already, 62 million hectares, or 20 per cent, of the world's total 300 million hectares of irrigated farmland has been salinized to some extent. Another 50 centimetres (1.6 feet) of sea rise, which is just half of what's expected by 2100, would swamp up to 1.9 million more hectares, the Intergovernmental Panel on Climate Change has said. That will undermine the world's ability to find the additional 120 million hectares of farmland it needs for a staggering 70 per cent increase in food production to feed the world by 2050, according to the U.N. Food and Agricultural Organization. Experts say there will be little choice but to grow some non-food crops along the coasts. The world's irrigated acreage could be increased by about 50 per cent by reusing saline water and salinized crop fields for halophytes, said University of Arizona environmental sciences professor Edward Glenn. 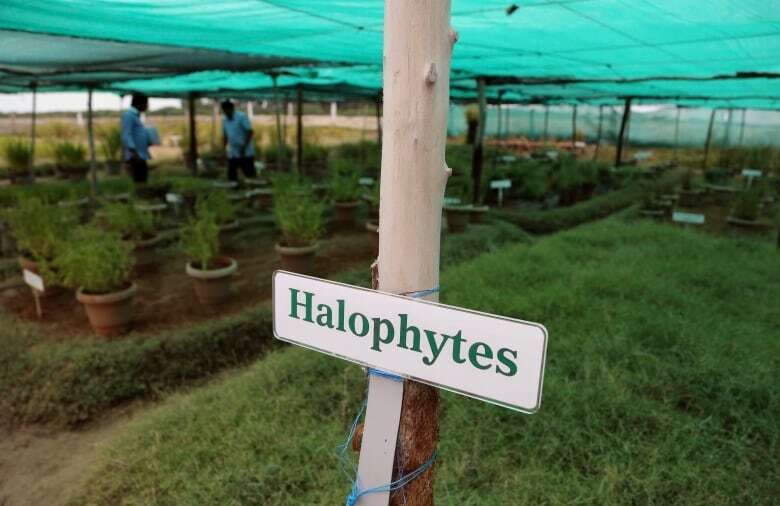 "As with aquaculture replacing wild fisheries, it is inevitable that halophytes will have their day," he said. Sesuvium portulacastrum. Paspalum vaginatum. Prosopis juliflora. These are just a few of the 350 known species of salt-tolerant plants that are candidates to become crops for the future. Saltwater plants are unlikely to become staple foods, because while often high in nutrients they're also very salty and so should be eaten in moderation. Species such as Salicornia europaea, also known as glasswort or samphire, are already sold in European markets as a fancy salad addition or side dish. The bright purple-and-white blossoms of Limonium are a florist's delight, while another species called Atriplex or saltbush is eaten by sheep. Supporters note a host of potential uses to make harvests profitable, including firewood, decorative flowers, kitty litter, nutritional supplements, cooking oil and biofuel. Cattle fodder is another possibility, and Indian herders already graze their cattle on thorny shrubbery by the sea. Despite the potential, saltwater agriculture is still seen as a fringe topic, even after decades of research by universities worldwide along with studies and pilot projects in countries including Mexico, Pakistan, Jordan and Eritrea. The aviation company Boeing is also researching biofuels from saltwater plants. India's scientists aren't waiting for markets to develop. Nor are they relying on just the halophyte garden to offer up new options. They're scouring coasts for wild grain species that might naturally tolerate some salinity, and using arduous breeding methods to create new salt-tolerant strains. The foundation has also developed genetically modified rice using genes from mangrove trees. It says the resulting plant can tolerate salt concentrations of 12-15 grams per litre. Seawater is typically two to three times saltier, but that's still a major improvement from currently cultivated rice varieties, which can handle only up to three grams per litre. Genetic modification is considered the most difficult approach, because salt tolerance is a trait that involves numerous genes. But the molecular biologist leading the development of GM halophytic rice believes it's essential. "Conventional breeding just takes too long, and this problem is urgent," said Ajay Parida, the foundation's executive director. His work stalled in 2007 under an effective moratorium on field testing GMOs, but the Indian government is considering shifting its GM testing policy and Parida now expects his trials to start soon. "We could eventually be cultivating wastelands and places considered entirely unsuitable," he said. "But it's only after crisis hits that people realize the magnitude of the problem and start pushing for an answer."